Kailash Mansarovar Overland Tour - Blue Mountain Travels and Tours (P.) Ltd.
Mt. Kailash alias ‘Jewels of snow’ as the Tibetians call it, is the most sacred mountain in Asia. The mountain believed to be an abode of Lord Shiva by the Hindus is also venerated by Buddhist, Jains and the Bon, Tibet’s indigenous religion. For thousands of years the Kailash region is the sources of the Ganges, the Sutlej, the Indus and the Brahamaputra River, which also drains the vast of Tibetan plateau. Hindus, declare it to be Lord Shiva’s throne and according to the legends river ganges is said to have emanated from one of strands of Shiva’s long matted hair. Buddhist cosmography identifies Kailash with the mighty Mt. Sumeru, the central peak of the world. 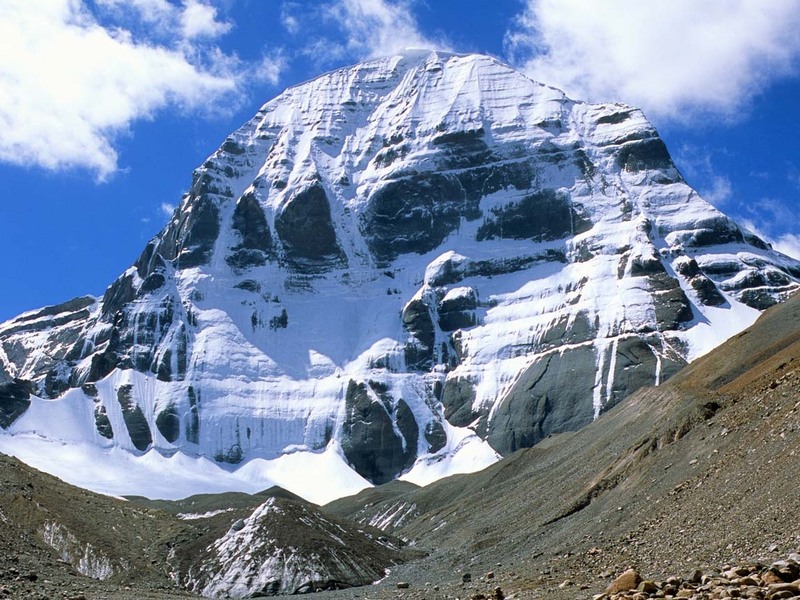 Jains identify the Kailash area with the place of their first saint’s spiritual liberation. As a Bon centre, Mt. Kailash is the soul of universe and assures perpetuity and protection for all the Tibetan people. Situated between Mt. Kailash and Mt. Gurla Mandata is the sacred lake Manasoravor. This is another important pilgrimage sites to the Tibetans. It is known as Mapham Tso (Lake), “the unconquerable lake”. As per the Hindu mythology it was formed in the mind of Lord Brahma (the creator). It was created to show the omnipotence of Brahma’s mind, ‘MANAS’. Holy Lake Manasorvar, the mother principle, represents Buddhist transcendent consciousness. Devotees and high lamas are found devoted chanting and praying ceaselessly as most make the difficult spiritual walk around Mt. Kailash and Lake Manasoravor (clockwise by Hindus and Buddhist and anti-clockwise by Bon religion). This hardest walk around Mt. Kailash is called Kora or Parikrama that normally takes three days and is believed to release from the sins of 100 births. A legend has it that even a beast that bears the name of Manasarovar shall go to the paradise of Brahma. This is a journey of lifetime – a pilgrimage for us all. We will do it best to make the tour with safe and smooth. As all the tour programs are conducted strictly under the rules and regulations of Tibet Tourism Bureau (TTB), we will not be accountable for any changes due to change of official rules and laws of Tibet. Moreover we will also not be liable for any changes in the itinerary due to unavoidable circumstances such as landslide, road blockage, flood, snow, political unrest, cancellation of flight, sickness and accidents. Any extra cost arising due to the above circumstances shall be borne by the clients on the spot. Upon arrival in Kathmandu Airport meet our office representative. He will assist to transfer the Hotel. In the evening tour briefing at the hotel. In the morning, you will visit Pashupatinath temple and Budhanilkantha, the sleeping Bishnu. Today your night halt will be either at Kathmandu or Nagarkot, hill station 35 km east of Kathmandu city. Optional tour: Morning Everest Mountain Flight (1 hr) can be done. Early morning you will drive towards Friendship bridge at Kodari border. After crossing the friendship bridge you go through immigration formalities. Rest day in Nyalam for acclimatization purpose. Today you go for a short hiking above Nyalam for a couple of hours. This will help you to be acclimatized properly. The journey starts with newly built road smooth and pleasant. Today you pass 5000m high pass, the Lung La with great views over the Himalayas including the closest Mt. Sashibangma. You also cross beautiful Peiku Lake, Brahmaputra River and Saga. Morning after breakfast you set off your journey back to Nyalam with sweet memory of Mt Kailash and Mansarovar Lake. From Nyalam you drive back to the friendship bridge at Kodari. After completing Chinese immigration formalities you drive to Kathmandu.